Yet there’s one thing that seems anything but enjoyable about them: dealing with their customer service. I’ve tried contacting YouTube about its Partner Program for a client. I was forced to take my client elsewhere because I never heard back. In my experience, these types of situations are the rule, not the exceptions. In many cases, it appears that customer service is entirely absent at some of Web 2.0’s most notable companies. Obviously, there are some logical reasons for this: most Web 2.0 companies are relatively small, they have more engineers than customer service agents and, to be honest, they have very few ‘customers‘. It’s easy to overlook customer service when you don’t have any customers (or you have far more ‘users‘ who never pay you a cent). But none of this means that customer service isn’t important to Web 2.0 companies, most of which fall under the categories of ‘ad-supported‘ or ‘don’t yet know how we’re going to make money‘; if they are to ever develop into long-term businesses that can sustain themselves, they need to get with the program. If Facebook is going to build strong relationships with key brand partners, you’d think it’d want to respond promptly to well-known rights holders. If Twitter is eventually going to charge for value-added features, you’d think it would take the time to demonstrate that it can respond to a person who has taken the time to build a service on top of its API. Most Web 2.0 companies don’t even have the luxury of losing a customer; they’re still at the stage of developing products and services worth buying and convincing enough people to spend their money on those products and services. 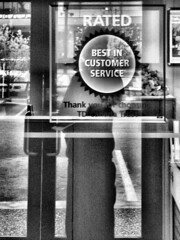 Unfortunately, without Customer Service 1.0, I fear that many Web 2.0 companies may find themselves stuck in first gear. Photo credit: striatic via Flickr.